Partick Thistle have only 13 contracted senior players remaining as 14 members of the squad that were relegated from the Scottish Premiership are released. Club captain Abdul Osman and Steven Lawless are among the more high-profile players not to be offered new deals. Under-contract Miles Storey, Adam Barton and Niall Keown have been placed on Thistle's transfer list. Midfielder Ryan Edwards has invoked a relegation clause in his contract allowing him to move on. 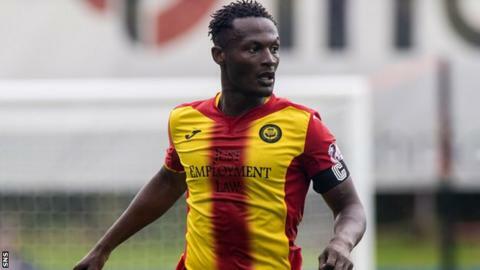 The Jags lost to Livingston in the Premiership play-off final, ending their five-year stay in Scotland's top flight. The club's board has kept faith in manager Alan Archibald, but he and his colleagues face a significant squad rebuild as they prepare for life in the Championship. Goalkeepers Tomas Cerny and Jamie Sneddon, defenders Christie Elliott and James Penrice, midfielders Callum Wilson, Chris Erskine, Andrew McCarthy and Blair Spittal, as well as striker Kris Doolan, have all been retained. Midfielder Stuart Bannigan also remains at Firhill for now, with his current deal running to August. Defender Baily Cargill and striker Conor Sammon return to respective parent clubs Bournemouth and Heart of Midlothian. Sammon, 31, scored 10 goals for Thistle in 36 appearances last season. Australian midfielder Edwards, 24, joined the Jags in 2015, scoring eight goals in 108 outings. Fellow midfielder Barton, 27, who has a solitary Northern Ireland cap, has spent two seasons at Firhill after moving north from Portsmouth. Defender Keown, 23, is the son of former Arsenal and England centre-back Martin Keown. Keown junior joined Thistle on loan from Reading in January 2017, making the move permanent in the summer. Striker Storey, 24, moved to the club from Aberdeen in August, but has scored only two goals for the Jags. Each of the three transfer-listed players has a year left on their current deal. Skipper Osman, 31, has been with Thistle for four years, but missed much of their campaign as he recovered from shoulder surgery. Goalkeeper Ryan Scully, defenders Callum Booth, Paul McGinn, Danny Devine, Mustapha Dumbuya and teenager Ross Fleming have all been released. The Jags have also dispensed with the services of long-serving midfielder Lawless, ending the 27-year-old's six-year stint at the club, as well as Gary Fraser, Mark Lamont, and Martin Woods. Attacker Connor Higgins and strikers Kevin Nisbet and Neil McLaughlin complete the list of released players. A Thistle statement thanked those departing for their services to the club.